One of the top Huacaya males of 2007! This multi-champion male possesses an impeccable pedigree- His sire, PC Running Late, is the 2003 All American Futurity Light Color Champion. Juxtaposition's grandsire (PC Running Late's sire) is the legendary 6Peruvian Accoyo Titan. Juxtaposition's dam MFI Peruvian Jamaica, is the daughter of Accoyo PPPeruvian Augusto, who sold for a world record price in the 2000. Jamaica was one of the offspring who made Accoyo Augusto so famous. As for Juxtaposition himself, he is a FIVE time champion with a soft, advanced fawn fleece exhibiting brightness, high-frequency, high amplitude crimp. In addition, he is a densely-fleeced male with an excellent phenotype and rock solid conformation. Juxtaposition has a commanding presence– everything you would expect in an exceptional herdsire. Solo is one of our best females with exceptional fleece, a great personality and healthy vigor. 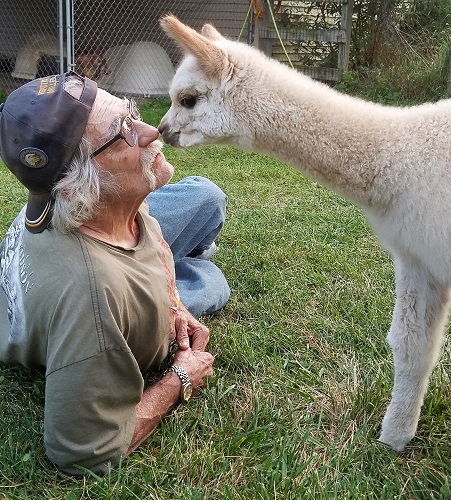 She earned the name "Flying Solo" because she was the first cria born on our farm with Bob attending the birth alone - Cora who normally handled new arrivals was on a flight commuting to work at the time. 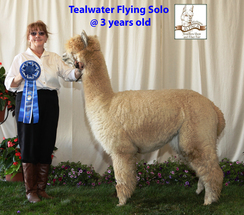 Solo carries some of the finest Huacaya genetics in the USA, starting with her dam Tealwater Ion Ranier. Ranier was purchased along side her Peruvian import dam as part of our foundation herd from Alpacas of America in Washington state. Ranie's sire is the renowned Peruvian Ion who sold at the America's Choice auction as highest selling male for $80,000 in 2005. He is prized for retaining fineness in his fiber regardless of age, and he passed that trait to his daughter Ranier. Ranie has been bred twice, both times producing champion quality fawn female crias - her first cria was Liberty Belle, a 2x Color Champion. We took Rainie to a 5x Champion herdsire, MFI Peruvian Juxtaposition to produce Flying Solo. Jux as he is called is a grandson of another phenomenal import, 6Peruvian Accoyo Titan. 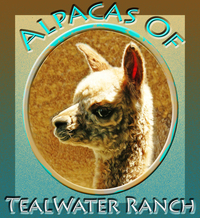 He has some of the best breeders' best alpacas behind him, including PPPeruvian Augusto, Peruvian Don Julio and NWA, LTD Jean. 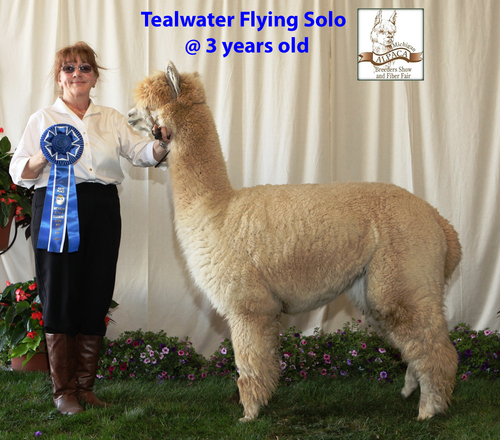 Solo's first halter show was an ALSA show judged by Mary Reed, who awarded Solo Reserve Color Champion behind another Accoyo Titan descendent.